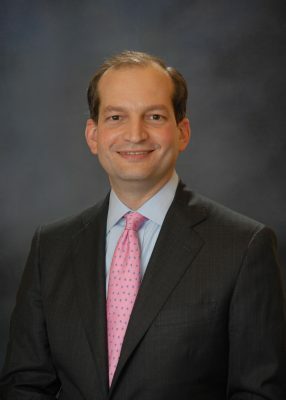 President Donald Trump on Thursday nominated FIU Law Dean R. Alexander Acosta for the position of secretary of the U.S. Department of Labor. Acosta, 48, joined FIU in 2009 and is the second dean to lead the FIU College of Law. Before coming to FIU he served as the United States Attorney for the Southern District of Florida. During his tenure at FIU, Acosta spearheaded the effort to establish the J.M. degree in banking compliance, BSA and anti-money-laundering at FIU Law. Under his stewardship, FIU law graduates also have ranked first among Florida’s 11 law schools in the bar passage rate three times in a row, for the July 2015, February 2016 and July 2016 examinations. 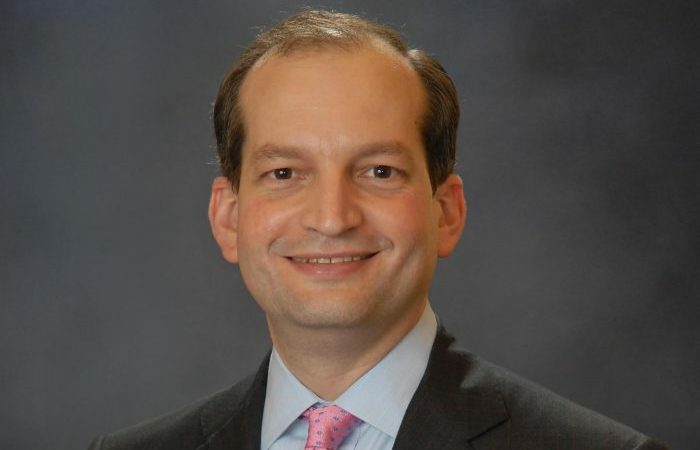 “Alex Acosta is a thoughtful, conscientious American who is dedicated to excellence, integrity and public service. We are proud that he is the first Hispanic nominated to serve in President Trump’s cabinet,” said FIU President Mark B. Rosenberg. A native of Miami and first-generation university graduate and lawyer, Acosta earned his undergraduate degree from Harvard College and his law degree from Harvard Law School. After serving as law clerk to Justice Samuel A. Alito, Jr., then a judge on the U.S. Court of Appeals for the Third Circuit, Acosta practiced law at the firm of Kirkland & Ellis and taught law at the George Mason School of Law. Acosta has served in three presidentially-appointed, senate-confirmed positions. He was a member of the National Labor Relations Board, where he participated in or authored more than 125 opinions. He went on to be the first Hispanic to hold the rank of Assistant Attorney General before becoming U.S. Attorney in 2005. What an Honor and well deserved GO Panthers. We did it again…We got the right stuff…. Impressive performance as a Dean of Law in FIU, places him as the best roll model of leadership for a whole community and for a new breed of lawyers willingfull and able to accept and prevail over the challenges of our convulsionate century. I feel proud that he has been nominated for the position of Secretary of the United States Department of Labor. I know that the Senate will confirm him once more. Our country needs him now. Please Jesus, Silence this Compulsive Liar ! – Normalize President Trump ?